Blurb: When is a whole more than the sum of its parts? When it has ties to the quaint little town of Ruthorford, Georgia—as Morgan Briscoe discovers when a cryptic message threatens to change her life forever. Morgan discovers that she is more than she seems and together she and Dorian have the ability to control a portal to another dimension. Unable to contain their growing attraction, Morgan and Dorian dance around their desires and her burgeoning abilities, until danger forces them to face their destiny. I want to thank you for having me as a guest. Since I have been interviewed and have written blogs about THE SHOPPE OF SPELLS until I feel like people know more about me than I do, I thought I would address something different: just what kind of research is needed to write a novel. I don’t know how others do it, so I will approach it from my perspective. And I’ll use my two favorites, THE SHOPPE OF SPELLS—available now, by the way—and MEADOW’S KEEP—due out late spring/early summer, as my examples. When an idea comes to me, as THE SHOPPE OF SPELLS did, I am never at a convenient place. For THE SHOPPE OF SPELLS, I was standing in line at Barnes & Noble ordering coffee and a scone. So, treats in hand, I proceeded to write on the scone bag. Now, the first question is: what prompted the idea? We had just moved to what I’ll call the low mountains around Atlanta and, since I’d never lived anywhere near a mountain (I came from the coast), I couldn’t wait to explore. I found quaint small southern towns, rolling vistas, and friendly people. Most of those friendly people also serve amazing food and have great shops so, be forewarned, shopping can occur. I also found a beautiful spot called Dunaway Gardens, a lot of acreage converted in the 1930’s by a plantation owner for his Chautauqua actress bride to entertain other actors and give performances. The place is magical, to say the least. Combining all I’d seen, I created Ruthorford, Georgia, the perfect southern town with a hidden secret. Another aspect to THE SHOPPE OF SPELLS is its descendants. They come from Scottish and Native American lineage. I researched the Native Americans of this area and found that they actually did marry people from Scotland. But, to further enhance the story, I had to research much more about the Native Americans in this area, which led me to stories about horrific incidents, like The Trail of Tears, as well as some wonderful traditions, like the passing down of folklore. For those of you who haven’t visited my website, www.shanongrey.com, I would love to have you stop by and enjoy two pieces of folklore I created for Ruthorford: The Legend of the Snowy Owl and The Legend of the Apple Star. Researching the paranormal aspect came much easier, since I’ve spent much of my life around the subject. Before Katrina, I had a library about many topics on man’s extraordinary abilities. (It helped to have a friend who loved tarot and every other manner of scrying.) Even without my books gone, I knew where to look. Granted, what I’ve created is purely speculative, but you never know. Unfortunately, and I say this only because of my limited scientific brain, I also had to do research about multiple dimensions. You would be surprised at the amount of research that done in that area. One is String Theory, which is physics, which I found daunting in college, when my brain was much faster. I managed to get through it, or as least enough, to feel comfortable incorporating it into my story. For both THE SHOPPE OF SPELLS and MEADOW’S KEEP, I had to do research on assault and “safe” houses. This was difficult research to do, since not everyone gets a happily ever after. However, I also learned about the incredible doctors and counselors that help victims, not to mention the wonderful law enforcement personnel that frequently rescue them. My hat goes off to all of these wonderful people who have the saddest and most difficult jobs. I had the most fun researching state fairs, small towns, private jets, and magic. If you’ve not been to a State Fair, I highly recommend it. While researching the Phenom 100 light jet, someone actually tried to sell me one. That would take a major lottery win, plus someone to fly it. However, I loved every minute of it. I did have the opportunity many years ago to see David Copperfield and meet him (my husband was actually on stage with him for a few moments). He is truly incredible. I love illusions and always wanted to include something in a story. Voila, Eryk Vreeland in MEADOW’S KEEP. I have only touched on the tip of my research. I sometimes spend hours just trying to figure out what I need or someone I need to talk to. It can be thrilling and it can be frustrating, but in the end, when the book comes out and readers are able to get lost in the story, I know I’ve done my job. Thanks for listening. 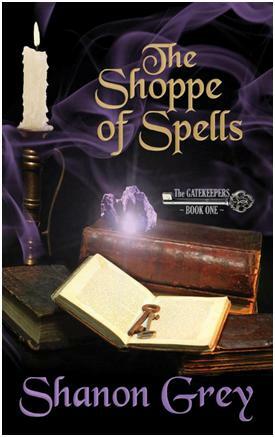 Since Reader Girls has reviewed of THE SHOPPE OF SPELLS, and included a teaser, all I will mention is that it is available now on Amazon and Barnes & Noble in both print and digital versions. I hope I have given you some insight into what goes into the writing of a novel. I wish I could say I just sit down and write. In some ways, I do, but I spend a lot of time making sure that what I write is plausible. There are days when the research becomes so much fun that I forget to write. All I want to do is the research. Then, there are days when I’m writing and know I need to back up and do some research on something I just wrote and I have to pull myself out of the storyline to do it. That, too, can be frustrating—stopping the flow and picking the rhythm back up. So, the next time you pick up a novel, no matter what it is, know that the author has taken a lot of time and made a great deal of effort so you can sit back and enjoy the story. Now, for me, I’m going to go pick up someone else’s novel for a bit—and let them do the work. Our review: Laurie really enjoyed The Shoppe of Spells and closed out her review with this: "Sit back, get comfortable, and let The Shoppe of Spells and Ruthorford's inhabitants enchant you." Read her entire review here. 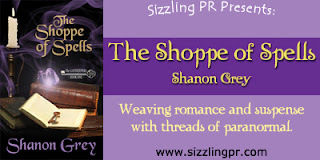 About the author: Shanon Grey weaves romance and suspense with threads of the paranormal. THE SHOPPE OF SPELLS is the first in her series, THE GATEKEEPERS, about the quaint town of Ruthorford, Georgia and its very special inhabitants. PENNYROYAL CHRISTMAS ~A Ruthorford Holiday Story~ is out in e-format as well. MEADOW’S KEEP is due to be released this spring. 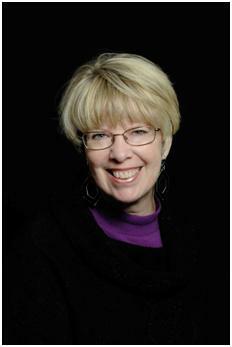 Under contract with Crossroads Publishing House, her books are available in e-format and print at most booksellers. You can join her on Facebook, follow her on Twitter or visit her website. Contact her at shanongreybooks@yahoo.com. She would love to hear from you. This does sound like a good read. Thanks for sharing! I love all the pretty purpleness of the covers! Fun! Can't wait to read Meadow's Keep!